The Wing Luke Museum’s new exhibit, “Worlds Beyond Here,” highlights Asian Pacific Americans in sci-fi, both as characters and creators. You step out of the spaceship door onto the platform, floating untethered a hundred stories above the mechanically vascular web of the metropolis beneath you. You check your com unit for the local day, time and number of planetary moons. It’s drink o’clock, so you head to the entertainment district via public hoverwalk. All around you the floating billboards and glittering high-rises blare their wares and identities in Chinese characters, Japanese hiragana or Korean hangul even though you’re closer to Mars than to Seoul. Then, as you approach the blinking towers, a giant Asian girl with pink hair bends down and blows you a kiss, and you know it’s the future, as much because she’s a hologram, as because she’s Asian. 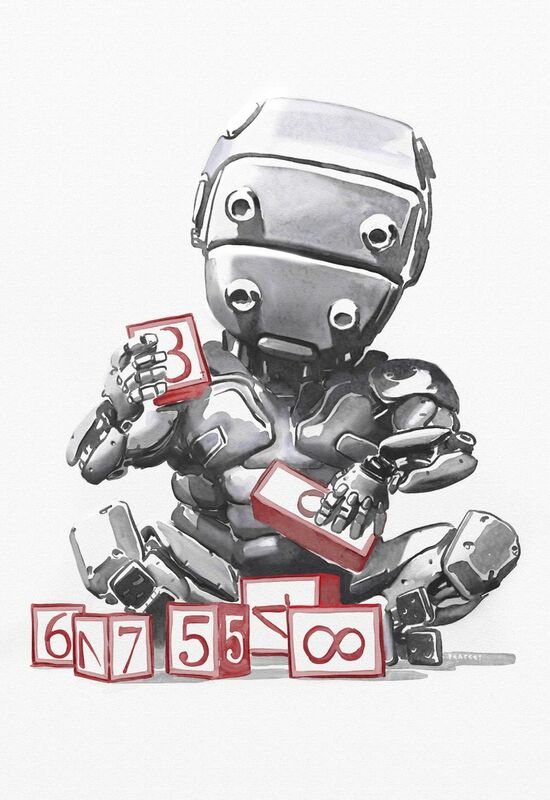 The above — an imaginary mash-up of sci-fi images — has become instantly recognizable for fans of the genre, a visual shorthand signaling that what you’re about to see takes place in the future. You can explore the idea of Asian imagery in sci-fi visions of the future at the Wing Luke Museum’s new exhibit, “Worlds Beyond Here,” which highlights Asian Pacific Americans in sci-fi, both as characters or creators, unfolding as an immersive journey through a young Asian-Pacific-American sci-fi writer’s inner life. The exhibit begins in a childhood bedroom full of “Star Wars” figurines (but only the Asian ones) and evolves into a workroom full of gadgets and robots, stopping off in the middle to play with the ideas running through a sci-fi fan’s head, like a VR meeting with aliens or an interactive puzzle featuring the alien language from the film “Arrival.” In the middle of the exhibit you are briefly arrested by a vast, Moebius-esque mural by animator and concept artist Simon Kono stretching across a curving wall, immersing the viewer into a glittering, ultramodern technocity, with Asian touches, that looms above a somewhat grimier waterway, a vision of a future Seattle that feels intuitively correct — perhaps because the idea of future cities as increasingly Asian is so pervasive. The most obvious example of this is director Ridley Scott’s sci-fi masterpiece “Blade Runner,” where the neon lights and steamy nights of Hong Kong were laid over a heavily urbanized Los Angeles. The film even begins with Harrison Ford visiting his favorite noodle stand for a bowl of ramen, signaling, perhaps, that this is a man perfectly adapted to navigate this tomorrowland. The “Blade Runner” aesthetic went on to influence (obviously) “Blade Runner 2049” as well as shows like Netflix’s “Altered Carbon” (its San Francisco-esque “Bay City” is an obvious sister city to “Blade Runner’s” Los Angeles) and Jean-Luc Besson’s “The Fifth Element” (with another detective-friendly noodle bar). In the genre of “future noir,” Asian languages glowing from neon signs became shorthand for “sometime tomorrow,” usually as a slightly cynical warning against the approaching dominance of both China and commercialism — as much an expression of anxiety as an acknowledgment of the inevitability of international trade. 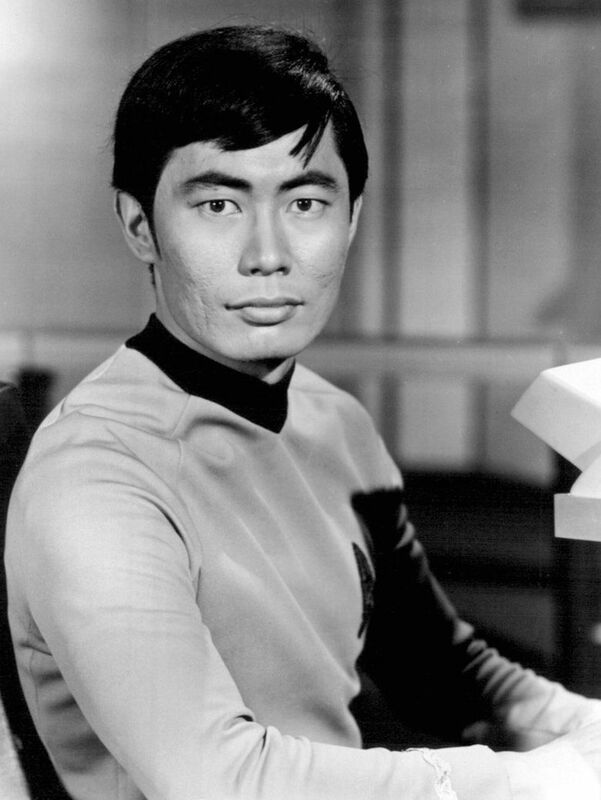 But while the theme of “Worlds Beyond Here” is simultaneously about the Asian presence in sci-fi (think Sulu in “Star Trek”) and the lack of Asian presence in sci-fi (i.e., there was only Sulu in “Star Trek”), the various visions of the future as made manifest by the featured artists turn a different lens on an Asian future, one in which the Asian-ness is not foreign, but familiar. This is epitomized by the work of sci-fi author Ken Liu who refers to some of his writing as “silkpunk,” a riff on steampunk that visualizes a tactile-techno world where the silks and gears of industrial age Victorian England are exchanged for silk, paper and bamboo. 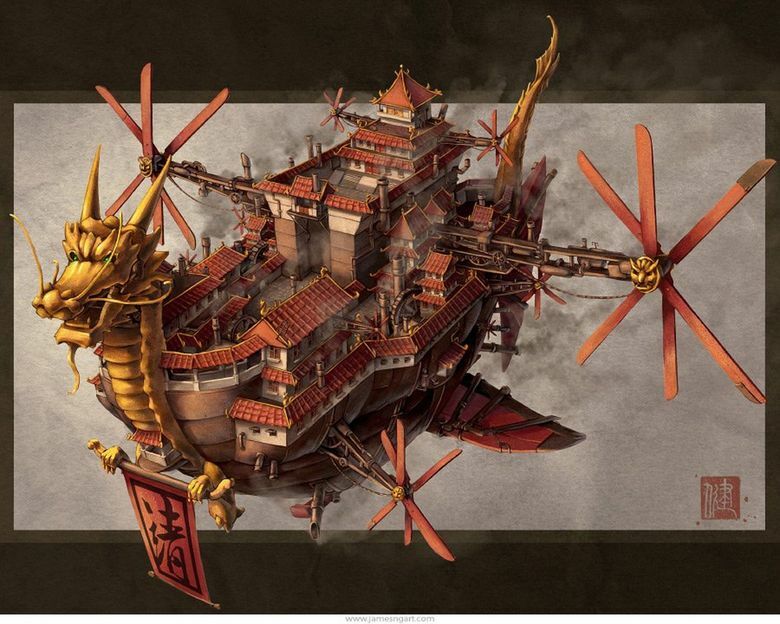 You can see this rendered in 2D in the work of concept artist and illustrator James Ng, as in the piece “Imperial Airship” which imagines a dragon boat/flying city spiky with upturned Chinese roofs, reading as both old and new. And in the Seattle of tomorrow in Kono’s mural, the Asian touches are done with a light hand, and feel integrated, complete with a high-rise pagoda, cargo ships with Chinese junk sails, and a Chinese fish kite flying from the tip of the Space Needle. “Worlds Beyond Here” concludes in an adult writer’s room, the place where the child from the beginning goes to render dreams into words — words that will, one imagines, create worlds full of characters who look more like them, in surroundings that now feel familiar. “Worlds Beyond Here: The Expanding Universe of APA Science Fiction,” through Sept. 15, 2019; Wing Luke Museum of the Asian Pacific American Experience, 719 S. King St., Seattle; free (for child under 5) to $17, 206-623-5124; wingluke.org.